In today’s increasingly digital age, it’s becoming ever more important for companies to adapt their business practices accordingly. Having an efficient system in place can help simplify and speed up basic processes, saving both time and money. Tokyo-based technology firm Konica Minolta offers a solution, with a unique Managed Print Services (MPS) model and a broad portfolio of services that covers everything from consulting right through to implementation. Catering to a diverse range of clients in 41 different countries across Europe and beyond, the company offers tailor-made solutions with the aim of improving efficiency and helping businesses become more sustainable. European CEO spoke to the company’s President, Ikuo Nakagawa. How does MPS fit in with the rest of Konica Minolta’s business? By optimising printing, MPS forms the basic foundation for Konica Minolta. However, printing is now just one component part of a whole document process, so companies need to digitise and face up to major challenges such as big data, the cloud and an increasingly mobile workforce. This is significant; given 90 percent of all corporate information assets are held in documents, the costs associated with insufficient document management can be substantial. Surveys show 7.5 percent – or one in 14 – of corporate documents go missing every year, and knowledge workers can spend up to 50 percent of their time searching for specific content items. What differentiates Konica Minolta from others in the MPS industry? Last year, US IT research company Gartner named Konica Minolta a leader in their Magic Quadrant for Managed Print and Content Services, which is a guide for organisations looking for MPS providers. In 2010, Konica Minolta started expanding its Optimised Printing Services (OPS) initiatives globally, and the company has now served more than 6,000 corporations worldwide. We have also introduced project management offices and specialised teams at our regional operations, to provide support to clients looking to optimise their business processes. We are passionate about creating strategies that lessen the need for printing, while reducing operational expenses and providing access to information as effectively as possible. The combined offering of our OPS, MCS and IMS services allows us to architect, implement and manage end-to-end solutions in a cost-effective manner while supporting our customers along the way. Konica Minolta can also analyse processes and implement solutions specifically for SMEs. We have a diverse array of clients of different sizes, from SMEs to global players, including automobile manufacturers, logistics companies, pharmaceutical companies and the hospitality sector. How important is sustainability in the company’s strategy? Konica Minolta’s management philosophy is ‘the creation of new value’ and it’s rooted in the core of our company. We take a comprehensive approach when it comes to sustainability, incorporating stakeholders into our mission. We recently received the RobecoSAM Gold Class Award for being the MFP market leader in terms of sustainability. We also feature on the Dow Jones Sustainability World Index and the FTSE4Good Global Index, and have been awarded the Blue Angel Mark and EPEAT Gold status. We also go beyond environmental sustainability, encouraging young people to start their own businesses. That has led us to become a Global Partner of Pioneers, a platform that encourages startup businesses across the continent. We also sponsor CNN Heroes, a programme that supports social entrepreneurship. What are Konica Minolta’s long-term environmental goals? According to the Intergovernmental Panel on Climate Change, greenhouse gas emissions in 2004 were 7.66t-CO2 per person per year. It’s estimated the amount the Earth will be able to absorb in 2050 is 80 percent less than that. These estimates were used to determine our Eco Vision 2050 target of an 80 percent reduction in lifecycle CO2 emissions by 2050 (compared to the level of emissions in 2005). As part of the programme, we are also focusing on preserving biodiversity, promoting recycling and ensuring efficient use of the Earth’s resources. We have broken these goals down into tangible objectives in our medium-term environmental plan for 2015, which includes measures to prevent global warming and reduce the risk of chemical substances. As part of our medium-term plan for 2016, we aim to reduce product lifecycle CO2 emissions by 40 percent from 2005 levels. We have already made substantial progress, achieving a 54.5 percent reduction between 2005 and 2013. What are the company’s biggest achievements to date? Konica Minolta is helping to simplify everyday processes for businesses while making work life more enjoyable. We have also made groundbreaking innovations in other fields, for example by developing the world’s first organic light emitting diode panel to be made using only phosphorescent materials, which uses significantly less electricity than conventional lighting. We developed the technology used to take the first ever Earth pictures from space (the Minolta Hi-Matic, during John Glenn’s Mercury Friendship 7 space flight in 1962). We’ve made substantial developments since then, including a special type of film that increases the viewing angle of LCD screens for use with TVs, PCs, smartphones and other devices. Our pick-up lenses are now used in almost all Blu-ray and DVD players. We have created materials to improve safety in cars, and thermal insulation in buildings. Our innovation extends to the healthcare sector, with products designed to help medical professionals. We created a device that lowers X-ray radiation exposure to patients (known as AeroDR) and in 2005 we released the first mammograph to use phase contrast technology. In 2002, we developed Simitri – the world’s first polymerised biomass toner. The product is both economical and environmentally beneficial, reducing CO2 and NOx emissions by up to 40 percent. We have received recognition for these achievements: in 1992, Konica Minolta became the first company in the world to receive a Blue Angel mark in the field of copying, and in 2013 we became the first of those using laser-based MFPs to receive the new Blue Angel Mark covering newly revised criteria (RAL-UZ 171). 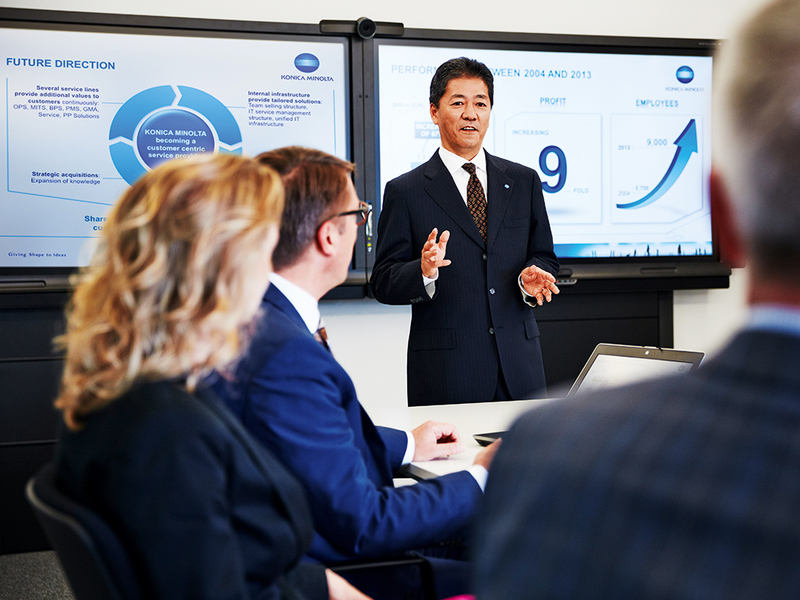 What are Konica Minolta’s ambitions for the future? Our fundamental goal is to anticipate our clients’ needs and turn their ideas into reality, by delivering innovative and meaningful solutions that contribute to a better future. We involve our clients in current developments that affect the market and provide them with tailored, end-to-end solutions. Our services, from consulting to implementation and management, cover the whole spectrum of business technology needs. Konica Minolta wants to give shape to people’s ideas, thoughts and concepts. For us, it is vital to not only understand our clients’ technology needs but to help businesses develop in the most effective ways possible. Konica Minolta has proven it can be as nimble as a startup, even though it builds on 140 years of tradition. We are especially proud of what we have achieved in Europe since Konica and Minolta merged just over 10 years ago and we hope to continue with those achievements in the future.